A Consuming Passion: Back to Tuesdays with Dorie! Back to Tuesdays with Dorie! After missing the last 2 TWDs, I was determined not to let another week go by without making this important appointment. So as soon as I got a chance , which turned out to be Wednesday night the week before, I got started on my Caramel-Topped Flan, this week’s recipe chosen by Steph of A Whisk and A Spoon. 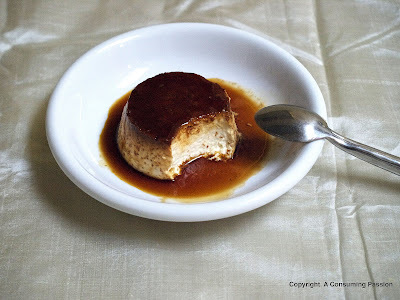 Now I’ve never made Crème Caramel before, even though I do enjoy it, and was amazed by just how quick it was to make. The caramel, given the 1/3 quantity I was making, was done in 5-7 minutes tops. The custard itself took only about 5 minutes to heat up and mix together. The only slight hassle is having to set up the baking tray with hot water to bake the custard, but honestly speaking, as long as you can read and follow instructions, its really not a big deal. After 35 minutes in the oven, my caramel has puffed up slightly, as the book said it would so I slid it out, ran my knife around the edge to loosen it and let it cool. I unmolded mine the next day after a night in the fridge and it slid out very easily with the caramel oozing out to coat the custard. The taste, needless to say, was divine – as all Dorie’s recipes are. 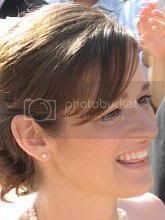 To see the rest of the TWD's efforts, please check out the blogroll here. Center a rack in the oven and preheat the oven to 350 degrees F. Line a roasting pan or a 9-x-13-inch baking pan with a double thickness of paper towels. Fill a teakettle with water and put it on to boil; when the water boils, turn off the heat.Put a metal 8-x-2-inch round cake pan-not a nonstick one-in the oven to heat while you prepare the caramel. Bake the flan for about 35 minutes, or until the top puffs a bit and is golden here and there. A knife inserted into the center of the flan should come out clean.Remove the roasting pan from the oven, transfer the cake pan to a cooking rack and run a knife between the flan and the sides of the pan to loosen it. Let the flan cool to room temperature on the rack, then loosely cover and refrigerate for at least 4 hours. It looks beautiful! It's always nice to have a quick recipe, huh? Oh wow, your caramel looks heavenly! It's so dark and gooey-looking. Yum! Ohh your caramel looks luciously dark and delicious! I was so afraid of burning mine (like I always do) that I probably didn't go far enough with it. It was a lovely recipe though. Your flan looks great! I love the dark caramel. 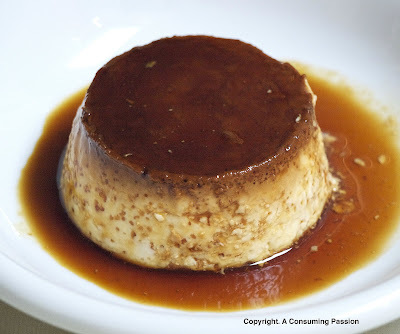 Lovely flan. Can I ask...did you use regular white sugar or a different type? It looks like ones I have made with azucar rubia, different that the normal white sugar caramel. Just curious! You had an easy recipe to come back to this week! Your caramel looks heavenly! I love how your caramel! It looks so yummy. Great job! Excellent color on your caramel, next time I'll let it go a bit longer. It looks picture perfect! Your caramel looks very good! I didn't let mine get as dark so it was very light. I haven't made this one yet but it's definitely on my to-do list! I was suprised how easy this one was. Great job! yours looks delicious. almost like chocolate on top. gives me some ideas. it's really much easier than you think it would be huh? great job!